Thaw the shrimp. To do this, place the frozen shrimp in a medium mixing bowl with a strainer inside it. Let the shrimp thaw in cold water for about 10 minutes. Drain the water and refill it again, for another 10 minutes. Preheat the oven to 400 degrees. In an oven safe Dutch oven (I used a Le Cruset), heat the Risotto olive oil to medium-high heat. Add the onion and stir until the onions are soft and translucent, about 4 minutes. Add the rice and stir to coat in the olive oil. Stir in the wine and cook until the wine has evaporated, about 2 minutes. Stir in the chicken broth, salt and pepper. Bring to a boil. Once boiling, remove from the stove. Cover and transfer to the oven. Bake for about 25 minutes. Once thawed and drained, place in a large ziplock bag. Add the rest of the ingredients. Close the bag and make sure to completely coat all the shrimp with the goodness. In a large non-stick saute pan, place the shrimp and marinade and cook, on medium-high heat for about 5 minutes, or until fully cooked. When the risotto is cooked, remove from the oven. Stir and add 1/2 cup of water and the Parmesan cheese. Stir to combine. 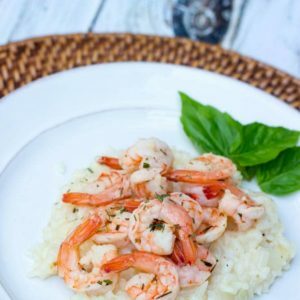 To serve, place the risotto on a plate and add the shrimp on top.